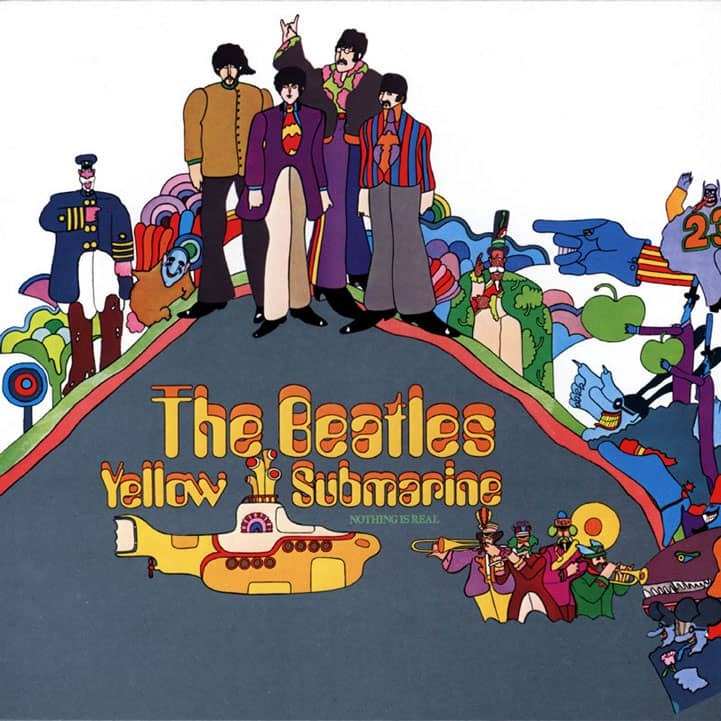 Unlike in the UK, there was no mono version of Yellow Submarine released. The catalogue number was Apple SW-153. Somewhere during the hours between the years 700 and 750 (anno Domini), a brother from the Northumbrian monastery wrote a youthful thane of King Hygelac (King of the Geats) named Beowulf... a hero. A super-hero who arrived from far by sea to rescue Heorot... a feasting hall built by a benevolent old king called Hrothgar... a feasting hall that exuded the pleasures of food and music and perpetual celebration and all that was raison d'être... a feasting hall which for years had been ravaged by the villainy of an evil spirit named Grendel. Having already proven his metal as a good-guy combatant par excellence (by the conquering of a picturesque sea monster and a victory over Breca in a swimming match), Beowulf goes forth to rid the once beautiful Northumbrian landscape of destructive Grendel... a demon who indeed perishes when his arm is delicately dislodged from its socket by Mr. Wulf. The kingdom is saved (albeit after disposing of Grendel's mother who took unkindly to the action) and Heorot restored with the pleasures of food and music and perpetual celebration and colorful beauty... a restoration which permits bigger and better glorias to be raised to the local gods addressed as Wryds. Some 465 years later (1215), an English king named King John signed a Magna Carta at a roost called Runnymede... an act of prodded royalty which liberated barons and bumpkins to roust with a greater degree of carefreedom. And in 1968 – some 1,218 years anno Beo (A.B); 753 years anno Magna (A.M.); 192 years anno Declaration (A.D.) – bad people (Blue Meanies) still force their wills on good people (Pepperlanders) and demolish the human and physical landscape of beautiful pleasure domes (Pepperland). And Agnes – the inquisitive baby sitter next door in California, United States of America – will be pleased to know that there are still heros around of the calibres of Messrs. Wulf, John and Jefferson... there's John, Paul, George and Ringo and their attending Lonely Hearts Club Band who sail from one place (Liverpool) at the invitation of a benevolent but old leader of another place (the Lord Mayor of Pepperland) to rescue the pleasures of food and music and perpetual celebration and colorful beauty from the villainous hands of less-than-beautiful people (Blue Meanies) who act under the supreme guidance of the most evil spirit (Chief Blue Meanie). The Beatles come by sea (through the Seas of Monsters, Time, Music, Science, Consumer Products, Nowhere, Green Phrenology and Holes – each puddle supporting a lively cast of characters) in a YELLOW SUBMARINE captained by Old Fred (also leader of Sgt. PLHCB) where they prove their heroic metal by outwitting a sea monster (Vacuum Man) and out-swimming competition (School of Whales) even before they reach the shores of the besieged undersea kingdom of Pepperland. Once arrived at target P., they triumph over the Chief Blue Meanie's primary evil-tempered henchmen (par exemple: the lanky Apple Bonker who assaults his prey with Baldwin apples; the corpulent Hidden Persuader with a penchant for underhanded inscrupulence; the abdominal Snapping Turtle Turk who chomps at the slightest bit; the belligerent Butterfly Stompers who perform tasks that any evil butterfly stompers worth their soul would perform with supreme acuity). The good guys win... the hero-Beatles triumph once again and restore the pleasures of color and music and all that's beautiful... a restoration which permits bigger and better glorias to be sung to the reigning god of Pepperland addressed as Love.